Do you want to live on a narrowboat because you think it’s a low cost alternative to living in a house? Living on a narrowboat is a fantastic lifestyle choice but the cost is possibly a little more than you expected. In this article ALL of the costs are detailed and explained. Below, I have detailed the general narrowboat costs that you will incur followed by some specific costs that I have faced since moving onto narrowboat James in April 2010. Your narrowboat will probably be your largest financial investment after your dry land home. If you want a brand new narrowboat designed and fitted out to your own specifications you can pay in excess of ?100,000. You will be able to pick up a decent second hand boat of about 60′ suitable for living aboard for about ?40,000. The majority of narrowboat owners have a boat in addition to a house. Some though fund the cost of their boat from the sale of their house. Whichever way you choose to fund your boast purchase, make sure you include any monthly finance repayment amounts in your calculations. Here’s a great place to research narrowboat designs and prices. Last time I looked, there were eight hundred narrowboats for sale. Insurance for your boat is a legal requirement. You can find a list of narrowboat insurers here. Please note that your intention to live on your narrowboat and the age of the boat will have an impact on the insurance cost so must be declared. Your car needs an MOT both as a legal requirement and as a regular check to make sure that it is safe to use. Your narrowboat needs a Boat Safety Scheme (BSS) Certificate when it is four years old and every four years after that. Here’s some very good information about the examination, the likely cost and what you need to do to prepare for it. River Canal Rescue offer breakdown cover for boat owners. They offer three levels of cover; bronze, silver and gold ranging in cost from ?55 to ?160 a year. Bronze cover simply registers your boat on their database. You pay additional fees for call outs and for towing you to the closest marina if they can’t easily repair your boat. Silver and Gold membership give you additional services and benefits such as an annual engine inspection (rather than a service). It’s essential cover for you if you don’t like to get too close to your engine or if your craft is a little long in the tooth. Mooring fees vary enormously but you can get an idea of the likely fees by the mooring location and the facilities on offer. A bankside mooring with no water or electricity is going to cost far less than a spacious mooring in a picturesque marina with all mod cons. At Calcutt Boats the fee for the older Locks marina is roughly ?2,090 for a 60′ boat. In the newer more spacious Meadows marina the standard piers are ?2,300 or ?2,683 for the 70′ moorings. Mooring fees are usually based on a single advance payment. There are often options to pay quarterly or monthly but they ill cost you more. Please note that many marinas also charge an additional amount for “high usage” so make sure you check the small print before you commit yourself. I don’t use diesel heating so don’t have any first hand experience. Work colleague and fellow moorer Anthony on his posh boat Second Sister does. He claims that he uses an average of 1/4 litre per hour over a 24 hour period or six litres per day. Diesel for heating is currently 78p per litre at Calcutt Boats. Please note that when you pay for your diesel, you will be asked to sign a declaration. Not all boats have separate tanks for propulsion and heating so the boatyard doesn’t know which part of your boat will use the fuel. Propulsion and heating diesel are identical but attract different levels of duty. The accepted split is 60% propulsion, 40% heating. So, if you put 100 litres into your tank, you will be charged 60 litres at the propulsion rate (about ?1.30 per litre) and 40 litres at the heating rate (78p per litre). However, some boatyards allow you to declare a different split. In theory, you can declare 100% for heating and pay for all of your fuel at the lower rate. In case of a government inspection though you need to be able to justify it. Every two to three years you will need to take your boat out of the water to “black” the hull. Blacking is a term used for the process of applying several coats of bitumen or other coal tar based paint to prevent rust. You can paint the hull yourself or ask a boatyard to do it for you. Either way, your boat will need to be removed from the water so that the work can be done. You should budget ?400 – ?500 for both removing your boat and having the work done for you. Just like your car, your boat needs to be serviced. And just like your car, the cost of those services can vary enormously. Here at Calcutt Boats, the cost of a service ranges from ?60 – ?160 plus parts. The costs detailed below are real costs. Every narrowboat related expense has been recorded by me since moving aboard narrowboat James. Each narrowboat’s day to day running costs will vary depending on the boat’s age, condition and equipment on board and equipment usage so let me tell you a little about James. In boating terms, James is an old girl. Built in 1975 with a steel hull and composite top, she’s 62’ long and has seen better days. James hadn’t been used more than two or three times in the previous ten years before I started to live on board full time in April 2010. Consequently she was in need of some TLC and was very damp. Because she hadn’t been used or maintained for such a long time, the windows and roof vents leaked and there was water seeping into the boat through the skin. The solid fuel stove (which heats four radiators along one side), had a cracked glass plate and leaks in the flu. All of the above meant that keeping warm and dry was a problem. The stove has now been refurbished and the windows and roof vents sealed. I think that there’s still a leak somewhere on the roof channelling water behind the cladding, which ends up under the floor of the rear cabin. Consequently I need to run a dehumidifier pretty much full time to combat the damp. As I said, every boat has differing factors which will impact on the running and maintenance costs. In addition to the boat’s age and the condition, the type of equipment used and how much it is used will also play a part. Whoever designed the heating on James liked to cover all available options. In addition to the solid fuel stove, there are four radiators – powered by the stove – plus gas heaters and an electric radiator. I also have a Dimplex greenhouse heater and a 1200w halogen heater for emergencies. There is a Paloma gas powered “on demand” heater which supplies an unlimited amount of scalding hot water. The hob, oven and grill are all gas and are powered by two 13kg Propane cylinders. The two cylinders do me for about two months. On Monday, Tuesday, Wednesday, Thursday, Friday and Saturday I get up at 05:15, shower, have a quick breakfast of tea and toast and work on the web site until 07:30. From October onwards the stove is burning coal twenty four hours a day, seven days a week. Overnight and when I’m away from the boat I have the stove turned down as low as possible to ensure that it’s still alight when I return. The maximum period is between ten and eleven hours. I come back to the boat for lunch and a cup of coffee, then return after work just after 5:30 and generally stay there for the evening. I use the gas for a shower every day, three or four kettle boils, toast in the morning, grilled meat or fish four times a week and a roast of some kind once a week. I don’t ever use the gas fires because they produce “wet” heat which contributes to the damp. My electricity is provided via a metered shore supply which charges the boat batteries for lighting. The shore power also allows me to charge my laptop/phone/electric razor, listen to the radio (I don’t have a television), power two Dimplex Coldwatcher 500w heaters (on all the time) and run a 620w dehumidifier for two hours a day. 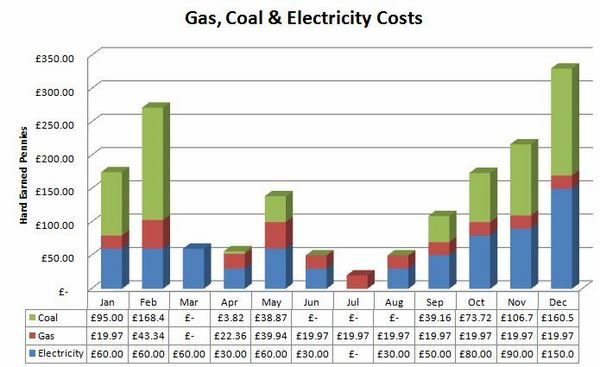 The graph below shows the actual costs incurred for gas, coal and electricity since moving onto James in April 2010. The costs are updated on the graph at the end of each month. 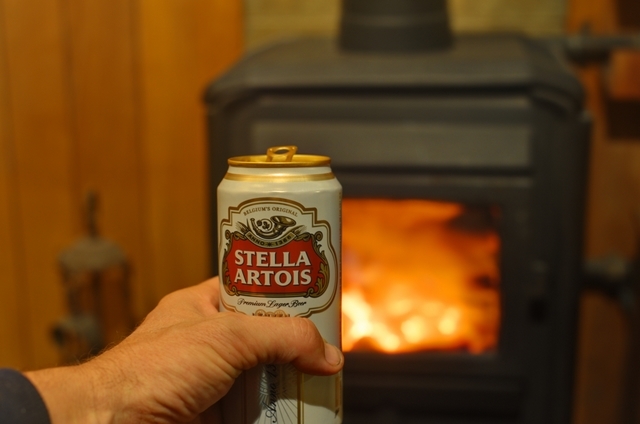 Your stove will burn either wood or coal. Personally, I steer clear of wood. It’s more bulky than coal so needs more storage space than I have available. My stove is also on the small side so I would struggle to fit logs in. I use coal. I’ve tried a number of different brands and types but the ones I’ve stuck with is Pureheat. Pureheat is a manufactured smokeless fuel sold in 25kg bags of goose egg sized ovals. Pureheat produces more heat than wood or housecoal, burns away to a powder so doesn’t clog up the grate (and put the fire out) and is less messy. A bag of Pureheat usually lasts me just under three days although in December with so many sub -zero days and ridiculously cold nights, I was using a bag every two days. The cheapest supplier I can find charges ?9.50 a bag. Mobile of course. Reception varies wildly when you’re on the cut. I have very poor reception with Three on my mooring. I can only make and receive calls from one spot halfway between the dining and the seating area. I just about get a signal there. I tend not to use a phone much anyway (no friends) so my mobile phone cost is about ?15 per month. A connection to the internet is one of life’s essentials as far as I’m concerned. I update the web site daily, send out newsletters, stream TV programmes from BBC iPlayer and the ITV and channel 4 equivalents, tweet on @narrowboatlife and search for information. So now you know what it costs to live on a narrowboat. At least, you know what it costs me to live on one. I’m sure that many narrowboat owners with newer, better insulated boats will pay less than me for heating fuel and electricity. But they will have paid more than me for their narroboat. I hope you find this guide useful – and I hope the costs haven’t put you off. I love living on a narrowboat. I hope you do too. I finished writing this post in February 2011, just over a year ago. I thought it would be a useful exercise to review the figures quoted above to see if they have changed after the second year of living aboard. When I moved onto James two years ago, the boat was cold and damp in all but the warmest weather. The damp was due to water seeping – sometimes pouring – through the four joins in the roof and then dripping through the internal cladding in heavy rain. The plywood cabin sides had also seen better days. James is moored broadside on to the prevailing south-westerly wind so on the port (weather) side of the boat the ply had deteriorated so much that water leaked through the window surrounds in wet and windy conditions. 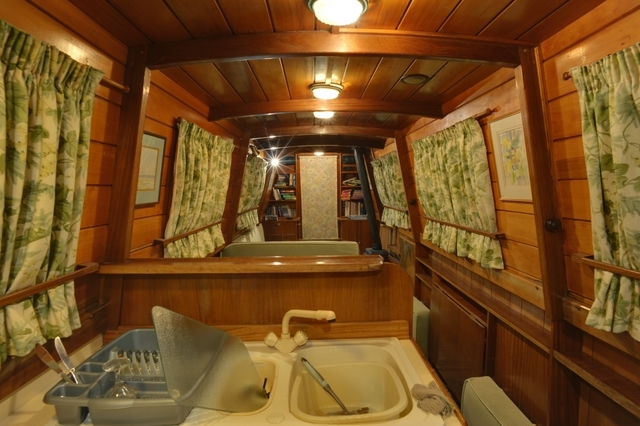 I didn’t want to replace the cabin because James is very well fitted inside with piranha pine cladding and plenty of cupboards and shelves. The best solution then was to overplate the existing cabin with 4mm steel. While the work was being done by local boat builder Reeves, I took the opportunity to fit a layer of one inch polystyrene between the existing masonite and the new steel. The work was completed in early November and what a difference it has made. The new steel means that James is now totally waterproof and the additional insulation has made a huge difference to the boat’s heat retention. And the boat is now more secure too. In addition to the roof and sides, new rear, side and front doors and new rear and side hatches were fitted. The new steel side hatches replaced the old deckboard hatches that could just be lifted off (locked or not) to gain access to the boat. I was very pleased with the work, and very pleased with the price. A new lease of life for James for just ?6,500 + VAT. Of course, that wasn’t the total cost. James had to be lifted out of the water and transported eight miles to Reeves in Bishops Itchington, about eight miles from the marina. The transport costed a staggering ?500 each way. There was also a fair amount of preparation and post fitting remedial work that needed doing. All of the windows, the roof vents, chimney, navigation lights and headlight had to be removed prior to the work and then refitted to the new steel cabin when James returned. Of course, there was then a 2″ gap between where the windows had fitted into the masonite cabin originally and where they ended up in the new steel cabin. Roger, our carpenter, did a fantastic job fitting a hardwood surround to all ten windows. As you can see from the graph above, from September 2010 to February 2011 I spent ?643.48 on coal. The expenditure was before the cabin was overplated and during one of the worst winters on record when, even with the stove operating at maximum capacity, I often had to resort to wearing a hat and two thick fleeces when I was working in my “office” twenty feet away from the fire. My gas consumption has remained pretty much the same. In the first year I spent ?163.16. The second year was ?194.14. The increase is due partly to the increase in the price of gas but more because of my increased use. My girlfriend Sally is now spending most of her time on the boat. She wasn’t even sure what a narrowboat was before she met me. She liked her clothes and had dozens of pairs of shoes, pairs of designer jeans and expensive handbags. Now she’s supremely happy traipsing along the towpath in her scruffiest jeans and wellies with her two spaniels Charlie and Daisy. Anyway, I digress. The increase in use is due to her having a shower twice a day. My electricity costs are down too. I spent ?520 in year one and ?345 in year two. I use far too much electricity. Our carpenter, Roger, lives on board a similar length narrowboat to me and uses just ?5 a month to light his two table lamps. I don’t yet have an inverter so I am totally reliant on my connection to the marina supply for any mains appliances. I don’t have a secondary heating system on the boat so, when the weather is too warm to have the coal fire burning but to cold not to have any heating at all, I have to use my two Dimplex 500w greenhouse heaters. I have an electric radiator in my bedroom at the rear of the boat. I used to leave it on all the time but over the last six months I have been turning it on just for an hour or two before I go to bed. I have also stopped using the dehumidifier now that the boat is no longer damp. That’s been a significant saving on electricity. I didn’t quote any figures for repairs and maintenance in the original post because I didn’t keep very accurate records of expenditure in that area at the time. I do now. I can tell you that since June last year when I started to keep records of repairs and maintenance costs, I have spent ?942.73. Roughly half of this was on a new cratch cover. I paid ?450 which was an absolute bargain. A decent cratch cover normally costs about double that. I knew several boaters who had used this guy and who spoke highly of him. He was as good as they said he was. It’s excellent. If you want his name and number, please let me know. What have I spent the rest on? Normal boaty stuff I’m afraid and stuff that you are likely to spend money on too. I bought paint, sanding discs, white spirit, paint brushes, two new padlocks for the front and rear doors, two spare ignition keys, varnish, a coat rack for the engine room, a power monitor to find out what each appliance was costing me to run, a new Porta Potti to replace the one that was marked by red hot sparks when the new steel work was done, a replacement for the Chinese hat that blew into the marina, a new coal shovel and brush and a set of jump leads so that, if my starter battery fails, I can still start the boat from the domestic batteries. My next planned expense will be the fitting of an inverter. I would be lost on the cut without one and, this year, I hope to spend more (some) time cruising. But I don’t want the inverter just for cruising. While I’m moored on the marina, my batteries are being constantly charged through the shoreline. I understand that a common problem is with the batteries of boats that have spent months charging their batteries from a mains supply. You need to get into the habit, even on a mooring with a mains supply, of charging batteries from the engine for several days at a time just to check the battery health. I can’t do that at the moment so I’m going to have to raid my piggy bank soon. 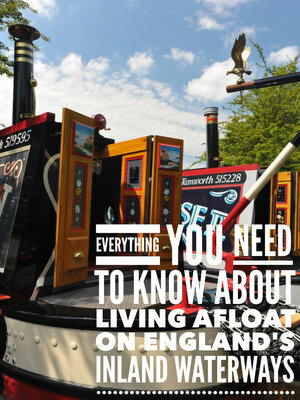 ,,Do you want to live on a narrowboat because you think it’s a low cost alternative to living in a house? Living on a narrowboat is a fantastic lifestyle choice but the cost is possibly a little more than you expected. In this article ALL of the costs are detailed and explained. The costs detailed below are real costs. Every narrowboat related expense has been recorded by me over the last twelve months that I have lived aboard narrowboat James. Each narrowboat’s day to day running costs will vary depending on the boat’s age, condition and equipment on board so let me tell you a little about James. In boating terms, James is an old girl. Built in 1975 with a steel hull and composite top, she’s 62’ long and has seen better days. James hadn’t been used more than two or three times in the previous ten years before I started to live on board full time six months ago. Consequently she was in need of some TLC and was very damp. All of the above meant that keeping warm and dry was a problem. The stove has now been refurbished and the windows and roof vents sealed. I think that there’s still a leak somewhere on the roof channelling water behind the cladding, which ends up under the floor of the rear cabin. Consequently I need to run a dehumidifier to combat the damp. As I said, every boat has differing factors which will impact on the running and maintenance costs. In addition to the boat’s age and the condition, the type of equipment used will also play a part. Whoever designed the heating on James liked to cover all available options. In addition to the solid fuel stove, there are four radiators – powered by the stove – plus gas heaters and an electric radiator. I also have a Dimplex greenhouse heater and a 1200w halogen heater for emergencies. There is a ????? gas powered “on demand” heater which supplies an unlimited amount of scalding hot water. The graphics are from Microsoft Excel. I used to keep all my data on a spreadsheet. Now I’ve “progressed” to an accounts package the graphs aren’t as good! Glad it helped though. GREAT ARTICLE….SHOWS SOME OF THE TRUE COST! Hello. I have lived on my boat for years and am a continuous cruiser therefore haven’t the luxury of a landline for electricity. Nor can I afford to have a shower every day, especially when iced in for weeks – I would soon run out of water. A kettle of water does me most days. As for the fire, I have a Morso Squirrel and use that to cook on during the winter months. I can do the usual stews and soups but also jacket potatoes and whole fish in kitchen foil in the ash tray (cleared of ash first ofcourse). But having said that, I found your article invaluable for those looking to buy their first boat. A good insight. Thanks for that. THAT’S what I call inventive! It’s for reasons like this that I don’t consider myself a proper liveaboard boater. I’m just a tiny bit jealous! thank you for your information,a group of us go boating twice a year and have a great time. I would have expected the fuel bills to be less than normal household bills but your costings appear to outweigh that plus the license and maintenance bills on top , so it certainly is not a cheaper option as i had expected. The fuel costs detailed here spanned the winter of 2010/2011 which was one of the coldest winters on record. Over the winter that has hopefully just gone, I have spent less than half what I did last year on coal. The gas usage has remained the same though as I only use gas for cooking and heating water. Thank you for pointing out the error. Do you know what the current fees are? Our inverter caught fire last week – I think it was a cheapo jobbie. Just purchased a new Sterling 1k at £200. I know cheaper ones are out there but thought it worth spending a bit more for something that is often recommended. Hi, good read as ever thank you. One comment on broadband, I use the 3 network too and use my phone to connect my laptop to the internet (tethering) I get all you can eat data and phone for £30 per month there are other better deals about too, you dont neccassarily need a dongle if you can get internet on your phone and have a decent signal. Thank you, I found this information and the other posts really useful. Nice that someone is willing to share such information instead of the usual statements that start with “it depends on …” and then still no hard facts. Have thought about living on a narrow boat for a number of years but after your article the electric seems a bit high so it has put me of a bit ! [but a very good article and what i like very truthful] so well done and i am still thinking about it? Peter… My electricity costs are high because I rely on a shore line to the marina mains supply. I also have two 500w electric heaters on the go all of the time which drives the cost up. Most liveaboards generate their own electrical power and have more efficient heating systems than I do so don’t let the cost of my electricity put you off. How much do you have to pay in Council Tax?